Parsa, M., Zargan, J., Honari, H., Haji Noor Mohammadi, A., Mousavi, M., Keshavarz Alikhani, H. (2017). In Vitro Study of the Toxicity Effects of Bacillus anthracis Protective Antigen. Journal of Applied Biotechnology Reports, 4(4), 681-686. Mohsen Parsa; Jamil Zargan; Hossain Honari; Ashkan Haji Noor Mohammadi; Mohsen Mousavi; Hani Keshavarz Alikhani. "In Vitro Study of the Toxicity Effects of Bacillus anthracis Protective Antigen". 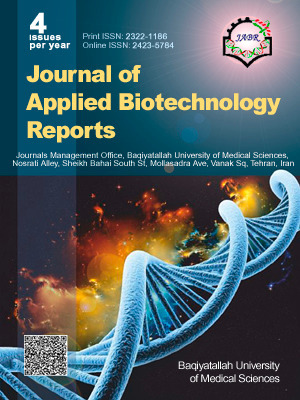 Journal of Applied Biotechnology Reports, 4, 4, 2017, 681-686. Parsa, M., Zargan, J., Honari, H., Haji Noor Mohammadi, A., Mousavi, M., Keshavarz Alikhani, H. (2017). 'In Vitro Study of the Toxicity Effects of Bacillus anthracis Protective Antigen', Journal of Applied Biotechnology Reports, 4(4), pp. 681-686. Parsa, M., Zargan, J., Honari, H., Haji Noor Mohammadi, A., Mousavi, M., Keshavarz Alikhani, H. In Vitro Study of the Toxicity Effects of Bacillus anthracis Protective Antigen. Journal of Applied Biotechnology Reports, 2017; 4(4): 681-686. Anthrax, a common disease of human and cattle, is caused by Bacillus anthracis infection. Protective antigen (PA) from Bacillus anthracis is a potent immunogen, which has been of interest in the development of new candidate vaccines against the disease. In this study, the toxicity effects of this antigen on prokaryotic (Escherichia coli and Staphylococcus aureus) and eukaryotic (MCF-7) cells were investigated. Antibacterial effects of the recombinant PA were analyzed using MTT and MIC (Minimum Inhibitory Concentration) assays. Cytotoxicity effect of the recombinant protein (in concentrations ranging from 0.5 to 2 µg/ml) on MCF-7 cell line was analyzed using MTT, Neutral red uptake, and comet assays. MCF-7 cells' oxidative stress following the treatment with PA (0.5-2 μg/ml) was analyzed by NO assay, reduced glutathione assay (GSH), and catalase activity assay. MTT and MIC assays showed that PA has a low inhibitory effect on Escherichia coli and no inhibitory effect on Staphylococcus aureus. Cell cytotoxicity assays indicated that the antigen significantly inhibits the growth of MCF-7 cells. Comet assay also showed that the antigen induces apoptosis in MCF-7 cells. According to nitrite oxide, reduced glutathione, and catalase activity assays, PA has not a significant effect on MCF-7 cells in comparison to the control (P<0.001). Protective antigen has no significant inhibitory effect on the growth of bacterial cells. However, it significantly inhibits the growth of the breast cancer cells (P<0.001). The effect of PA on breast cancer cells is pharmacologically important so that the antigen can be considered as a candidate anticancer molecule.